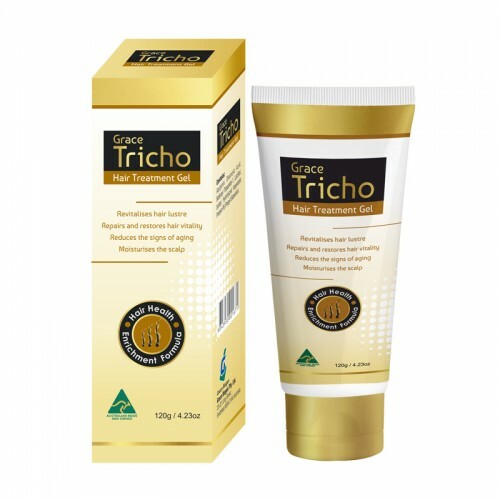 Tricho Gel works on multiple levels promoting better quality of hair and improved hair growth. The first of its kind, Tricho Gel has been designed by studying growing hair instead of studying the falling hair. There is a tripeptide complex found in abundance around all good growing anagen hair follicles, tricho gel includes this active peptide complex of Glycine - Histidine - Lysine (GHK) which serves as the natural signal for hair growth. GHK allows the follicle to be in a healthy growing environment. GHK is combined with Biotin as Bitinyl GHK, a strong healthy natural combination to improve the look and feel of the hair follicle. Tricho Gel inhibits the 5d - reductase with Oleanolic acid while improving the scalp blood flow with use of Api genin. The unique Keravis contained in the Tricho Gel formulation, forms a lubricant or protective film over the hair shaft, preventing flexaberasion from handling & tangles. Keravis penetrates the cuticle to add tensile strength to the hair shaft, protecting against hair breakage, bending and hair fatigue. Too often, the natural scalp balance is destroyed by water quality, hot showers, chlorine, over shampooing, drying, pollution, air conditioning, hair products, colouring, itching, irritation, redness, pain in the hair roots, sensitive scalp & dandrufi'. Tricho Gel has the right mix of Glycerine-Lactiol-Xylitol (GLX), which acts as a moisturiser, maintains the scalp microflora, regulates the pH balance, promotes a healthy proteolipid layer and ensures a healthy scalp for promoting a good hair growth. Tricho Gel is most suited for patients of any age as well as patients who cannot use Minoxidil or do not desire to use Minoxidil. Tricho Gel does not make the hair frizzy or unmanageable, it acts as a hair gel, improving the handling and the appearance of the hair. Apigenin, Oleanolic Acid, Biotinoyl Tripeptide-1, Lactitol, Xylitol, Hydrolyzed Vegetable Protein PG-Propyl Silanetriol. Apply twice daily to the scalp, massaging gently in a circular motion. For best results use in conjunction with Grace Hair Fact Supplements. Keep away from children. Always read the label carefully before use.